For the TV series, see Marshal Peng Dehuai (TV series). This is a Chinese name; the family name is Peng. Péng lǎozǒng, "Old Chief Peng"
Peng Dehuai (Chinese: 彭德怀; pinyin: Péng Déhuái; October 24, 1898 – November 29, 1974) was a prominent Chinese Communist military leader, who served as China's Defense Minister from 1954 to 1959. Peng was born into a poor peasant family, and received several years of primary education before his family's poverty forced him to suspend his education at the age of ten, and to work for several years as a manual laborer. When he was sixteen, Peng became a professional soldier. Over the next ten years Peng served in the armies of several Hunan-based warlord armies, raising himself from the rank of private second class to major. In 1926 Peng's forces joined the Kuomintang, and Peng was first introduced to communism. Peng participated in the Northern Expedition, and supported Wang Jingwei's attempt to form a left-leaning Kuomintang government based in Wuhan. After Wang was defeated, Peng briefly rejoined Chiang Kai-shek's forces before joining the Chinese Communist Party, allying himself with Mao Zedong and Zhu De. Peng was one of the most senior generals who defended the Jiangxi Soviet from Chiang's attempts to capture it, and his successes were rivaled only by Lin Biao. Peng participated in the Long March, and supported Mao Zedong at the Zunyi Conference, which was critical to Mao's rise to power. During the 1937–1945 Second Sino-Japanese War, Peng was one of the strongest supporters of pursuing a ceasefire with the Kuomintang in order to concentrate China's collective resources on resisting the Japanese Empire. Peng was the senior commander in the combined Kuomintang-Communist efforts to resist the Japanese occupation of Shanxi in 1937; and, by 1938, was in command of 2/3 of the Eighth Route Army. In 1940, Peng conducted the Hundred Regiments Offensive, a massive Communist effort to disrupt Japanese logistical networks across northern China. The Hundred Regiments Offensive was modestly successful, but political disputes within the Communist Party led to Peng being recalled to Yan'an, and he spent the rest of the war without an active command. After the Japanese surrendered, in 1945, Peng was given command of Communist forces in Northwest China. He was the most senior commander responsible for defending the Communist leadership in Shaanxi from Kuomintang forces, saving Mao from being captured at least once. Peng eventually defeated the Kuomintang in Northwest China, captured huge amounts of military supplies, and actively incorporated the huge area, including Xinjiang, into the People's Republic of China. Peng was one of the few senior military leaders who supported Mao's suggestions to involve China directly in the 1950–1953 Korean War, and he served as the direct commander of the Chinese People's Volunteer Army for the first half of the war (though Mao and Zhou Enlai were technically more senior). Peng's experiences in the Korean War convinced him that the Chinese military had to become more professional, organized, and well-equipped in order to prepare itself for the conditions of modern technical warfare. Because the Soviet Union was the only communist country then equipped with a fully modern, professional army, Peng attempted to reform China's military on the Soviet model over the next several years, making the army less political and more professional (contrary to the political goals of Mao). Peng resisted Mao's attempts to develop a personality cult throughout the 1950s; and, when Mao's economic policies associated with the Great Leap Forward caused a nationwide famine, Peng became critical of Mao's leadership. The rivalry between Peng and Mao culminated in an open confrontation between the two at the 1959 Lushan Conference. Mao won this confrontation, labeled Peng as a leader of an "anti-Party clique", and purged Peng from all influential positions for the rest of his life. Peng lived in virtual obscurity until 1965, when the reformers Liu Shaoqi and Deng Xiaoping supported Peng's limited return to government, developing military industries in Southwest China. In 1966, following the advent of the Cultural Revolution, Peng was arrested by Red Guards. From 1966–1970, radical factions within the Communist Party, led by Lin Biao and Mao's wife, Jiang Qing, singled out Peng for national persecution, and Peng was publicly humiliated in numerous large-scale struggle sessions and subjected to physical and psychological torture in organized efforts to force Peng to confess his "crimes" against Mao Zedong and the Communist Party. In 1970 Peng was formally tried and sentenced to life imprisonment, and he died in prison in 1974. After Mao died in 1976, Peng's old ally, Deng Xiaoping, emerged as China's paramount leader. Deng led an effort to formally rehabilitate people who had been unjustly persecuted during the Cultural Revolution, and Peng was one of the first leaders to be posthumously rehabilitated, in 1978. In modern China, Peng is considered one of the most successful and highly respected generals in the history of the Chinese Communist Party. Peng was born in 1898 in the village of Shixiang, Xiangtan County, Hunan. His personal name at birth was "Dehua". Peng's family lived in a thatched-straw hut and owned approximately 1.5 acres of irrigated land, on which the family grew bamboo, sweet potatoes, tea, cotton, and various vegetables. His father also operated a bean curd shop. The income from the land and shop supported an extended family of eight people, including Peng, his three brothers, his parents, his grandmother, and a grand-uncle. Peng's grand-uncle had joined and fought for the Taiping rebellion, and used to tell Peng about the old Taiping ideals: that everyone should have enough food to eat, that women should not bind their feet, and that land should be redistributed equally. Peng later described his own class background as "lower-middle peasant". From 1905–1907, Peng was enrolled in a traditional Confucian primary school. In 1908 Peng attended a modern primary school; but, at the age of ten, was forced to withdraw from this school due to his family's deteriorating financial situation. In 1905–1906, there was a severe drought in Hunan. Peng's mother died in 1905, and Peng's six-month-old brother died of hunger. Peng's father was forced to sell most of his family possessions for food, and to pawn most of his family's land. When Peng was withdrawn from school in 1908, he and his brothers were sent to beg for food in their village. From 1908–1910, Peng took a job looking after a pair of water buffaloes. When Peng's grand-uncle died in 1911, Peng left home and worked at a coalmine in Xiangtan, where he pushed carts of coal for thirteen hours a day for a wage of nine yuan a month. In 1912, shortly after the founding of the Republic of China, the mine went bankrupt and the owners fled, cheating Peng out of half his annual wages. Peng returned home in 1912 and took a number of odd jobs. In 1913 Hunan suffered another drought, and Peng participated in a public demonstration that escalated into the seizure of a grain merchant's storehouse, and the redistribution of grain among the peasants. Village police issued a warrant for Peng's arrest, and he fled to northern Hunan, where he worked for two years as a construction laborer for the construction of a dam near Dongting Lake. When the dam was completed, in 1916, Peng assumed that he was no longer in danger of being arrested and returned home, joining the army of a local Kuomintang-aligned warlord, Tang Xiangming. Peng enlisted as a private second class, with a monthly wage of 5.5 yuan, 2 yuan of which he sent back to support his family. Within seven months he was promoted to private first class, with a monthly wage of 6 yuan, 3 yuan of which he sent to his family. One of Peng's commanding officers was an idealistic Nationalist who had participated in the 1911 Xinhai Revolution, who influenced Peng to sympathize with the Kuomintang goals of social reform and national reunification. When another civil war broke out in 1917, Peng's regiment split from the rest of its army and joined the forces of Tang Shengzhi, who was aligned with Tan Yankai and Sun Yat-sen, against those aligned with the northern warlord Wu Peifu. During this period Peng received training in formal tactics from an officer in his brigade. In July 1918 Peng was captured while on a reconnaissance mission behind enemy lines, but was released after two weeks. In April 1919 Peng was promoted to master sergeant and acting platoon commander. Tang Shengzhi's forces drove enemy troops out of Hunan in July 1920, capturing the provincial capital of Changsha. Peng participated in a failed mutiny over pay, but was pardoned. In August 1921 Peng was promoted to the rank of second lieutenant, and became acting company commander several weeks later. While stationed in a village in Nanxian, Peng noticed that the poor were being mistreated by a local landlord, and encouraged them to establish an "association to help the poor". When the local villagers hesitated, Peng ordered his soldiers to arrest the landlord and execute him. Peng was reprimanded for his actions, but not demoted or reassigned. After the incident, Peng began to think seriously about leaving the service of his provincial warlord army. In February 1922, after applying for extended unpaid leave, Peng and several other officers traveled to Guangdong to seek employment in the army of the Kuomintang. Peng's impression of the Kuomintang in 1922 was not favorable, and he left Guangzhou with the intention of settling back in Hunan as a farmer. Peng returned to his home village by sea via Shanghai (then the farthest he had ever been from his home village), and farmed with his father for three months on land which his father had bought with money that Peng had sent home, but Peng did not find this occupation satisfying. When one of Peng's old comrades suggested that Peng apply to the local Hunan Military Academy to seek employment as a formally trained professional officer, Peng accepted. Peng successfully gained admission in August 1922, using the personal name "Dehuai" for the first time. In August 1923, after nine months of training, Peng graduated from the academy and rejoined his old regiment with the rank of captain. He was promoted to acting battalion commander in April 1924. In 1924 Tang Shengzhi aligned himself with northern warlords against the warlord controlling Guangdong, who was aligned with the Kuomintang. Peng conducted skirmishes along the Hunan-Guangdong border for nine months, but reorganized his battalion along pro-Kuomintang political lines in 1925. In late 1925 Chiang Kai-shek established the National Revolutionary Army (NRA) and led the Kuomintang to take control of Guangdong. Tang then aligned himself with Chiang and joined him in the Northern Expedition, an effort to unify China by defeating the northern warlords. The Hunanese army was reorganized, and Peng was promoted to the rank of major. When Wu Peifu invaded Hunan and occupied Changsha, Chiang sent the NRA to Hunan, beginning the Northern Expedition. Peng's forces then joined the Kuomintang, though Peng never joined the party as a formal member. It wasn't until after Peng joined the Kuomintang, in 1925, that he first heard of the Communist Party. Between July 1926 and March 1927 Peng campaigned in Hunan, participating in the capture of Changsha and Wuhan. Under general He Jian, Peng participated in the Battle of Fengtai, in which Kuomintang forces decisively defeated the warlord Wu Peifu. In 1927, Wang Jingwei attempted to establish a left-leaning Kuomintang government in Wuhan that threatened Chiang Kai-shek's leadership. Tang Shengzhi, who Peng served under, aligned himself with Wang, and Peng was promoted to lieutenant-colonel and regimental commander. After Tang's forces were decisively defeated by Chiang, Peng commanded the rear guard, protecting the retreat of Tang's forces back into Hunan. In 1927 Peng was approached several times by Communist Party members, some of which were old friends, who attempted to recruit him into the Communist Party. In August 1927 Peng was approached by an old military comrade, Huang Gonglue (黄公略): Peng was sympathetic, but could not decide to join the Party. On October 12, Peng was approached by Duan Dechang, a Communist Party representative: Peng again expressed sympathy and interest, but at that time considered himself a member of the "Kuomintang left wing", and could not yet bring himself to break with the party. Peng considered joining the Communist Party for some time, met Duan again later that October, and began to study basic communist theory. Peng secretly joined the Chinese Communist Party in mid-February 1928. In February 1928 Peng joined general Ho Chien when Ho defected back to Chiang's forces, and gained a promotion to full colonel after rejoining Chiang. After rejoining Chiang's Nanjing government, Peng was stationed in the mountainous Pingjiang County, northwest of Changsha. His orders were to eliminate local groups of communist guerrillas who had fled to the area following the Shanghai massacre of 1927. Because Peng had secretly joined the Chinese Communist Party, he instead kept his unit passive and began to organize local Communist Party branches. Peng made contact with local communist guerrillas, nominally attached to the forces of Mao Zedong and Zhu De, and decided to issue a pronouncement in favor of the Communists on July 18, 1928. On July 22, 1928 Peng's forces, approximately 2000 men, occupied Pingjiang County, arresting and executing the county magistrate and over 100 landlords and local militia commanders. On July 23 Peng declared the establishment of the "Hunan Provincial Soviet Government", formally aligning himself with Mao and Zhu. On July 29 Peng's former superior, general Ho Chien, attacked Peng's forces, inflicting heavy casualties. By September, Peng's forces were driven into the mountains, and by October only several hundred men remained. 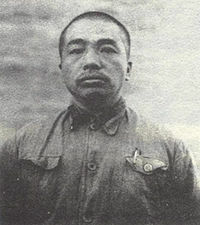 Peng then abandoned his bases and left to join Mao and Zhu at their base in the Jinggang Mountains. Peng's forces successfully joined Mao and Zhu in November 1928. Some of Peng's subordinates in the rebellion survived and became important military figures themselves, including generals Huang Kecheng and Peng Shaohui. By his mid-30s, Peng was one of the most senior generals in the Jiangxi Soviet (1934 - 1935). After joining forces with communist guerrillas, one of Peng's first actions was to save Mao, whose forces were being encircled by Kuomintang units: Peng broke the encirclement and drove the enemy off. Peng then met with Zhu and Mao, and they reorganized their forces and decided to form a base area around the Ruijin, Jiangxi, an agricultural city that was only defended by weak warlord units. Zhu and Mao occupied the area, informally beginning the Jiangxi Soviet in January 1929. Peng remained behind to guard Jinggangshan with a force of 800 soldiers, but withdrew from the area when it was attacked by a Hunanese Kuomintang force of 25,000 soldiers, joining Zhu and Mao in Ruijin in March. Although he had saved his force from destruction, he was criticized by Mao for withdrawing. Peng returned to Jinggangshan with a force of 1,000 men later that year, occupying the area after the Kuomintang withdrew. In mid-1929 Peng's forces merged with the forces of two local bandit groups, but conflicts arose over supplies and the command structure, and the two groups rebelled against Peng in July 1929. One of the bandit leaders was captured and executed by Peng, and the other committed suicide. The remaining forces were incorporated into Peng's unit, bringing its strength up to 2,000 men. Peng then organized a series of increasingly ambitious raids into southern Hunan throughout 1929 and 1930, capturing an increasing amount of supplies and attracting more recruits. On July 13, 1930, the de facto leader of the Chinese Communist Party, Li Lisan, issued a general order for communist units around China to "conquer one provincial capital" as a signal for a "nationwide revolutionary storm". Peng took these general orders seriously, and launched an attack on Hunan's capital, Changsha, on July 25, with 17,000 soldiers under his command, and with the support of another 10,000 guerillas. Changsha was then defended by general Ho Chien, Peng's former superior. Peng's forces broke through the Kuomintang lines on July 28, and occupied Changsha proper on July 30, which Ho hastily evacuated. On August 1 Peng declared the establishment of a "Hunan Provincial Soviet Government", with Li Lisan (who was living in the French concession area in Shanghai) named chairman, and Peng himself as vice-chairman. On August 5, Ho counterattacked with a force of 35,000 men. Peng suffered 7,500 casualties, and was forced to withdraw back to Jinggangshan. On September 1, Peng again attempted to capture Changsha, but this attack was halted on the outskirts of the city with heavy casualties. 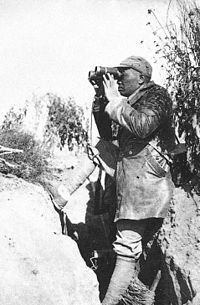 Mao and Zhu kept their own forces from assisting Peng during his attempts to take Changsha, and Peng withdrew his forces into the Jiangxi Soviet in late 1930. Peng was one of the most important generals active in defending the Jiangxi Soviet, taking a leading role in defeating Chiang Kai-shek's first three Encirclement Campaigns, from December 1930 – May 1931. His successes were outmatched only by Lin Biao. On November 7, Peng was named to the Central Military Commission and to the Central Executive Committee of the Jiangxi Soviet, the first time that he had been named to a position of political leadership within the communist movement. After the consolidation of the Jiangxi Soviet, a number of USSR-trained Communist Party leaders arrived and took power in the Soviet: Peng, like most communist military leaders, supported their leadership until the Jiangxi Soviet was eventually overrun. In August 1933, Peng was named Vice-Chairman of the Central Military Commission; and, in January 1934, Peng was appointed as an alternate member to the Sixth CCP Central Committee. Peng continued the defense of the Jiangxi Soviet throughout the early 1930s. In August 1933, after the indecisive Fourth Encirclement Campaign, Peng broke through Kuomintang defenses and conquered a large area of western Fujian, capturing great quantities of arms and ammunition. In October 1933 Chiang Kai-shek took command of nearly 800,000 soldiers, leading the Fifth Encirclement Campaign against the Red Army's force of 150,000 men. By September 1934 the Fifth Encirclement Campaign was largely successful, and Peng's own units suffered heavy casualties defending the Soviet, shrinking from 35,000 to around 20,000 men. On October 20, 1934 the communists broke out of Chiang's encirclement and began the Long March. 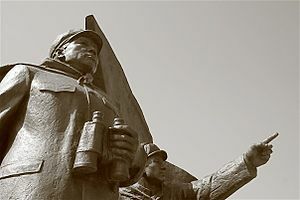 Of the 18,000 men under Peng's command when the March began, only about 3,000 remained when Peng's forces reached their eventual destination in Shaanxi on October 20, 1935. Peng was a strong supporter of Mao's rise to power during the January 1935 Zunyi Conference. Peng continued to consolidate the communists' base area after arriving in Shaanxi, campaigning in neighboring Shanxi and Gansu. In April 1937, Peng was named vice commander-in-chief of all Chinese communist forces, outranked only by Zhu De, who was named commander-in-chief. Peng's promotion was supported by Lin Biao, who had been actively supporting Peng for promotions to senior leadership as early as May 1934. In early 1935 Lin responded to widespread discontent within the Red Army over Mao's evasive tactics (which were perceived inside the Red Army as unnecessarily exhausting) by publicly proposing that Peng take overall command of the Red Army; but Mao, who had recently been promoted to the position, attacked Peng and Lin for challenging him and successfully retained his position. In October 1935, following the last major battle between the KMT and the Red Army, Mao wrote and dedicated a poem to Peng. (The poem was not published until 1947). Who is the courageous one, striking from his horse in all directions? None other than our great General Peng! In 1936 the American journalist, Edgar Snow, stayed for several days at Peng's compound in Yuwang while Peng was campaigning in Ningxia, and had long conversations with him. Snow wrote two whole chapters about Peng in his book, Red Star Over China. He wrote more about Peng than any other individual, except for Mao Zedong. Peng Dehuai commanded the largest communist offensive in the war against Japan. After the 1937 Marco Polo Bridge Incident, China and Japan formally went to war. When the Kuomintang and Communist Party declared a united front to fight the Japanese, Peng was confirmed as a general in the unified command structure of the NRA. At the August 20, 1937 Luochuan Conference (洛川会议), Mao believed that the united front should be used as a feint, giving token resistance to the Japanese while saving the strength of the Red Army for the eventual confrontation with the Kuomintang, but Peng, along with most other senior military and political leaders at the time, disagreed, and believed that the Red Army should genuinely focus on fighting the Japanese. Mao was not able to force his position, and the communists cooperated with the Kuomintang and fought the Japanese. When the Japanese invaded Shanxi, the Red Army (renamed the Eighth Route Army) assisted the Kuomintang warlord, Yan Xishan, in resisting the Japanese, and Peng travelled to the provincial capital of Taiyuan with Zhou Enlai to coordinate tactics. After the Japanese advanced towards Taiyuan on September 13, 1937, Peng directed overall operations from a base in Wutaishan, but was called from duty to attend a Politburo meeting on December 13. At the meeting, Peng advocated a greater material commitment to the defense of Shanxi, but Mao disagreed and wanted the Red Army to reduce its commitment to fighting the Japanese. In 1938, after Mao's rival, Zhang Guotao, defected to the Kuomintang, Peng moved closer to Mao's position. In late 1938, Peng set up a base in Taihangshan, on the borders of Shanxi and Hebei, and directed guerrilla operations in both provinces. From Taihangshan, Peng commanded 2/3 of the Eighth Route Army, approximately 100,000 soldiers. In July 1940 Peng was given overall command of the largest communist operation of the anti-Japanese war, the Hundred Regiments Offensive. 200,000 regular troops from the Eighth Route Army participated in this operation, supported by 200,000 irregular communist guerrillas. From August 20 – October 5, 1940, communist forces destroyed large numbers of bridges, tunnels, and railroad tracks in Japanese-occupied China, and inflicted relatively heavy Japanese casualties. From October 6 – December 5, the Japanese counterattacked, and the communists mostly repelled the counterattack successfully. Peng's operation was successful in disrupting Japanese communication lines and logistics networks, which were not fully restored until 1942, but the communists suffered heavy losses, In communist sources, the Japanese casualties have two figures, one of which is 20645 and the other of which is 12645. Foreign sources give figures of 20900. In early 1941, the Japanese began a large-scale effort to drive Peng from his base in Taihangshan, and Peng relocated closer to the communist base in Yan'an in late 1941. After being recalled to Yan'an, Peng was subjected to a political indoctrination campaign in which he was criticized as an "empiricist" for his good relations with the Comintern, and only survived professionally through an unconditional conversion to Mao's leadership. Mao ordered Peng to be criticized for forty days for the "failings" of the Hundred Regiments Campaign (even though Mao had supported it, and afterwards praised its successes). Peng was not allowed to reply, and was forced to make a self-criticism. Privately, Peng resented Mao's criticism of him, and in 1959 once told Mao: "At Yan'an, you fucked my mother for forty days." From 1942–1945, Peng's role in the war was mostly political, and he supported Mao very closely. In June 1944 Peng was part of a team that held conferences with American military personnel that visited Yan'an as part of the Dixie Mission, briefing the Americans about the military situation in Japanese-occupied China. The Japanese surrendered on September 3, 1945, ending China's war with Japan and beginning the final stage of the Chinese Civil War. In October Peng took command of troops in northern China, occupied Inner Mongolia, and accepted the surrender of Japanese soldiers there. In March 1946, Communist forces (1.1 million soldiers) were renamed the "People's Liberation Army". Peng himself was placed in command of 175,000 soldiers, organized as the "Northwest Field Army", most of which had been under the command of He Long during the war against Japan. He then became Peng's second-in-command. Peng's notable subordinates in the Northwest Field Army included Zhang Zongxun and Wang Zhen. Peng's forces were the most poorly armed of the newly reorganized army, but were responsible for the area around the communist capital, Yan'an. In March 1947, the Kuomintang general, Hu Zongnan, invaded this area with 260,000 soldiers. Hu's forces were among the best-trained and most well-supplied Nationalist units, but one of Zhou Enlai's spies was able to provide Peng with information about Hu's strategic plans, his forces' troop distributions, strength, and positions, and details about the air cover available to Hu. Peng was forced to abandon Yan'an in late March, but resisted Hu's forces long enough for Mao and other senior Party leaders to evacuate safely. Mao wanted Peng to provoke a decisive confrontation with Hu immediately, but Peng dissuaded him, and by April Mao agreed that Peng's objective was to "keep the enemy on the run... tire him out completely, reduce his food supplies, and then look for an opportunity to destroy him". On May 4 Peng's forces attacked an isolated supply depot in northeast Shaanxi, arrested its commander, and captured food reserves, 40,000 army uniforms, and a collection of arms that included over a million pieces of artillery. Peng's forces were pushed back to the border of Inner Mongolia, but finally managed to decisively defeat Hu's forces in August, in the Battle of Shajiadian(沙家店战役), saving Mao and other members from the Central committee from being taken prisoner. Peng eventually pushed Kuomintang forces out of Shaanxi in February 1948. Between 1947 and September 22, 1949, Peng's forces occupied Gansu, Ningxia, and Qinghai. His forces repeatedly defeated, but were not able to destroy, the forces of Hu Zongnan and Ma Bufang, which retreated into Sichuan and were airlifted to Taiwan when the Kuomintang lost the Civil War in December 1949. In October Peng's forces, led directly by Wang Zhen, invaded Xinjiang. Most of Xinjiang's defenders surrendered peacefully, and were incorporated as a new unit in Peng's army, but some ethnic guerrilla bands resisted Chinese control for several years. After the People's Republic of China was declared on October 1, 1949, Peng was appointed Chairman of the Northwest China Military and Administrative Commission and Commander-in-Chief and Political Commissar of Xinjiang, with Wang Zhen as his deputy. This appointment gave Peng responsibility over Shaanxi, Gansu, Ningxia, Qinghai, and Xinjiang, an area of over five million square kilometres (1.9 million square miles) but under thirty million people. Peng's forces continued their gradual occupation of Xinjiang, which they completed in September 1951. A statue of Peng now stands on the Chinese border with Korea, on the place that Peng crossed into North Korea in 1950. North Korea invaded South Korea on June 25, 1950. After receiving its endorsement from the United Nations, the United States landed its first troops in Korea on September 15. On October 1, the first anniversary of the founding of the People's Republic, UN forces crossed the 38th parallel into North Korea. There was some disagreement within China's leadership about how to react to the American push to the Chinese border: Mao and Zhou wanted direct military intervention, while most Chinese leaders believed that China should not enter the war unless China was directly attacked. Lin Biao was Mao's first choice to lead the Chinese People's Volunteer Army (PVA) into Korea, but Lin refused, citing his bad health. Mao then sought the support of Peng, who had not yet taken a strong position, to lead the PVA. Peng flew to Beijing from Xi'an (where he was still administering northwest China and directing the incorporation of Xinjiang into the PRC), and arrived on October 4. Peng listened to both sides of the debate, and on October 5 decided to support Mao. Peng's support for Mao's position changed the atmosphere of the meeting, and most leaders changed their positions to support a direct Chinese intervention in the Korean War. On October 5 Peng was named the Commander and the Commissar of the People's Volunteer Army and held both titles until the Korean Armistice Agreement in 1953. Mao directed China's general strategy, and Zhou was appointed general commander, coordinating Peng's forces with the Soviet and North Korean governments, and the rest of the Chinese government. Over the next week, Peng established a headquarters in Shenyang, and prepared his invasion strategy with his officers. After Zhou and Lin negotiated Stalin's approval, Peng attended a conference in Beijing with Mao, Zhou, and Gao Gang on October 18, and they ordered the first wave of Chinese soldiers—in total more than 260,000 men—to cross into Korea on the night of October 19. On October 25 the PVA had its first confrontation with UN troops at Onjong and Unsan, and pushed the UN forces south of the Chongchon River by November 4 in the aftermath of First Phase Campaign. From November 24 to December 24, Peng directed 380,000 PVA troops to confront UN forces in the Second Phase Campaign, and he successfully recovered the area north of the thirty-eighth parallel. Despite his personal reservations, Peng then began an ambitious campaign to take the area south of the 38th parallel in order to fulfill Mao's political objectives for the war. About 230,000 Chinese soldiers crossed into South Korean territory on December 31 and captured Seoul as part of the Third Phase Campaign, but were forced to evacuate it with heavy losses on March 14, 1951 as the UN forces counterattacked during the course of Fourth Phase Campaign. Peng launched a final Fifth Phase Campaign from April 22 – June 10 to retake Seoul with 548,000 Chinese troops, but it failed, and the Korean War came to a standstill just above the 38th parallel. During the Cultural Revolution, Red Guards claimed that Peng's successful campaigns, from October–December 1950, were fought under Mao's direction, but that his unsuccessful campaigns, from January–May 1951, were organized by Peng against Mao's instructions. Modern scholars reject this interpretation, and credit Peng with both the successes and failures of the war. PVA casualties during the first 12 months of the Korean War, from October 1950 to October 1951, were heavy. Soviet material support was slight; and, because the only available means to transport supplies into Korea for the first year of the war was a force of 700,000 labourers, all available supplies were light and limited. The UN forces also had complete air superiority. These logistic constraints later caused 45,000 Chinese soldiers to freeze to death between November 27 and December 12, 1950, due to inadequate winter clothing. China's insufficient artillery, armor, and air support meant that Peng was forced to rely heavily on human wave tactics until the summer of 1951: stealthy fireteams attacked in column against weak points in enemy defenses, hoping that surprise, attrition and perseverance would break the enemy lines. Participants even drank large quantities of Kaoliang wine in order to improve their courage. Some of the worst Chinese battle losses occurred during the Second and the Fifth Phase Campaign: up to 40 percent of all Chinese forces in Korea were rendered combat ineffective between November 25 and December 24, 1950, and about 12 Chinese divisions were lost in during April 22 – June 10, 1951. All in all, over a million Chinese soldiers became casualties during the course of the war. Peng justified the PVA's high casualty rate by his almost religious belief in the cause of Communism and the Communist Party, and his belief that the ends of the conflict justified the means. Some accounts even claimed that Peng invented the human wave tactic under the name "short attack" in order to exploit his manpower advantage. On November 19, 1951, Zhou called a conference in Shenyang to discuss improvements to China's logistical network, but these did little to directly resolve China's supply problems. Peng visited Beijing several times over the next several months to brief Mao and Zhou about the heavy casualties suffered by Chinese troops and the increasing difficulty of keeping the front lines supplied with basic necessities. By the winter of 1951–52, Peng became convinced that the war would be protracted, and that neither side would be able to achieve victory in the foreseeable future. On February 24, 1952, the Central Military Commission, presided over by Zhou, discussed the PVA's logistical problems with members of various government agencies involved in the war effort. After the government representatives emphasized their inability to meet the demands of the war, Peng, in an angry outburst, shouted: "You have this and that problem... You should go to the front and see with your own eyes what food and clothing the soldiers have! Not to speak of the casualties! For what are they giving their lives? We have no aircraft. We have only a few guns. Transports are not protected. More and more soldiers are dying of starvation. Can't you overcome some of your difficulties?" The atmosphere became so tense that Zhou was forced to adjourn the conference. Zhou subsequently called a series of meetings, where it was agreed that the PVA would be divided into three groups, to be dispatched to Korea in shifts; to accelerate the training of Chinese pilots; to provide more anti-aircraft guns to the front lines; to purchase more military equipment and ammunition from the Soviet Union; to provide the army with more food and clothing; and, to transfer the responsibility of logistics to the central government. Peng also became a zealous supporter of the Three-anti Campaign due to his belief that corruption and waste were the main causes of the PVA's hardship. 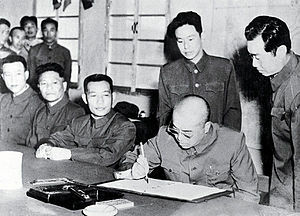 In 1953, Peng signed the armistice agreement which ended the Korean War. Truce talks began on July 10, 1951, but proceeded slowly. Peng was recalled back to China in April 1952 due to a head tumor, and Chen Geng and Deng Hua later assumed Peng's responsibilities in the PVA. On July 27, 1953, Peng personally signed the Armistice agreement in Panmunjom, ending the Korean War. At a mass rally in Pyongyang on July 31, Kim Il Sung awarded Peng his second North Korean "National Flag" Order of Merit, First Class (the first had been awarded to Peng in 1951), and awarded Peng the title of "Hero of the Korean Democratic People's Republic". Peng also received a hero's welcome in Tiananmen Square on August 11. Chinese troops remained in North Korea until 1958. Peng's experiences in the Korean War strongly affected his outlook over the next decade. The heavy losses sustained during the first year of the war convinced him that the Chinese army needed to change by introducing modern equipment and standards of professionalism, and by developing new tactics more suited to modern conventional warfare. He came to believe strongly that military training should never be reduced in favour of political indoctrination, and that military commanders should enjoy seniority over commissars. Because the only communist country fully prepared for modern technical warfare was the Soviet Union, Peng grew to see the Soviet Red Army as a model for the development of China's PLA. These perspectives, and Peng's long-held conviction that the primary role of the Communist Party was to improve the welfare of the common people, were contrary to Mao's political goals, contributing to their eventual conflict in the late 1950s. Stalin once arbitrated in favor of Peng in a conflict with a Russian diplomat, saying "Trust him in everything; Peng is a long-tested, talented militarist". After being recalled back to China in April 1952, Peng succeeded Zhou in managing the day-to-day affairs of the Central Military Commission in July 1952; and, in the spring of 1954, Peng was confirmed as the vice-chairman of the Commission (Mao was its chairman), becoming effectively the most senior military leader in China. On September 24, 1954, the First National People's Congress confirmed Peng's position, and appointed him Defense Minister and one of the ten vice-ministers of the State Council. Lin Biao was senior to Peng on the State Council. Soon after accepting these appointments, on October 1, 1954, Peng produced an ambitious plan for the modernization of the PLA on the model of the Soviet military. After returning to China from the Korean War, Peng became engaged in a rivalry with Mao Zedong over the political future of China (Photo: Hou Bo). Peng had been an alternate member of the Central Committee since 1934, a full member since 1938, and a member of the Politburo since 1945, but it was not until he became the leader of the PLA and moved permanently to Beijing, in November 1953, that Peng was able to attend regular political meetings and became active in domestic politics. Peng had been loyal to Mao's leadership since the 1935 Zunyi Conference, and continued to support Mao for several years after moving to Beijing. Peng (like Lin Biao) was implicated in passively supporting Gao Gang's effort to replace Liu Shaoqi as the second most powerful person in China in 1953, but then opposed Gao in 1954, once Mao made his own opposition clear. Mao did not take any action against Peng (or Lin), but Peng's involvement alienated Peng from Liu and Liu's supporters. In 1955 Peng supported Mao's efforts to collectivize agriculture. Along with Liu Shaoqi, Zhu De, Lin Biao, Lin Boqu, and Luo Ronghuan, Peng opposed Mao's attempt to liberalize China's culture and politics in the first stages of the 1957 Hundred Flowers Campaign, but then supported Mao's efforts to arrest and persecute Chinese citizens who had criticized the CCP later that year. During the late 1950s, Peng developed a personal dislike for Mao's efforts to promote his own image in Chinese popular culture as a perfect, infallible hero singularly responsible for the Communist victories of his time. In 1955–56 Peng was involved in a large number of efforts to moderate Mao's popular image, developing into a personal campaign. Peng's preference for modesty and simplicity led Peng to oppose Mao's efforts to develop his personality cult. In 1955 a draft copy of a book, The Military History of the PVA, was submitted to Peng so that he could edit and authorize it. In the preface of the book it was stated that "the military victories of the PVA" were won "under the correct leadership of the CCP and of Comrade Mao Zedong": Peng authorized the text after removing the phrase "and of Comrade Mao Zedong". In 1956 an anonymous Chinese citizen wrote a letter to Peng condemning the practices of hanging portraits of Mao in public places and singing songs in praise of Mao: Peng sent this letter to Huang Kecheng, his chief of staff, to be widely distributed. Peng successfully opposed efforts to place a bronze statue of Mao in the Beijing Military Museum, saying: "why take the trouble to put it up? What is put up now will be removed in the future." When greeted by a group of soldiers who shouted "Long Live Chairman Mao!" (literally "10,000 years for Chairman Mao"), Peng addressed the soldiers, saying: "You shout '10,000 years for Chairman Mao!' – does he, then, live for 10,000 years? He will not even live for 100 years! This is a personality cult!" When one of Peng's political commissars suggested that the Maoist hymn The East is Red should be widely taught throughout the PLA, Peng angrily rejected the suggestion, similarly saying "That is a personality cult! That is idealism!" Later in 1956 a group of soldiers visited Peng in order to request an audience with the Chairman, but Peng rejected them, saying: "He is an old man, what is so beautiful about him?" In preparation for the Eighth National Congress, held in September 1956, Peng attended a Politburo committee to redraft the new Party Constitution. At this meeting, Peng suggested that a section in the Constitution's preamble referring to Mao Zedong Thought be removed. Liu Shaoqi, Deng Xiaoping, Peng Zhen, and most other senior CCP members present quickly agreed, and it was removed from the final version of the 1956 Party Constitution. At the Congress, Peng was re-appointed to the Politburo and as a full member of the Central Committee. Peng resented Mao's personal lifestyle, which Peng considered decadent and luxurious. By the late 1950s Mao had developed a lifestyle that was out of touch with Peng's preference for modesty and simplicity. Mao enjoyed a private pool in Zhongnanhai, and had many villas around China built for him, which he would travel to on a private train. Mao enjoyed the companionship of an ever-changing succession of enthusiastic young women whom he met either on weekly dances in Zhongnanhai or on his journeys by train. Mao had a costly office suite built for him in Beijing, including a private, book-lined study. When Peng's wife suggested the couple spend more free time visiting Mao's quarters, Peng was reluctant, stating that Mao's surroundings were "too luxuriously furnished" for him to tolerate. Throughout the 1950s, Peng continued to refer to the Chairman as "Old Mao", an egalitarian title that was used among senior CCP leaders in the 1930s and 1940s. Peng staged his first offensive after becoming Defense Minister in January 1955, when he attacked and occupied a chain of islands, part of Zhejiang, which were still held by the Kuomintang, from which the Nationalists occasionally staged guerrilla raids as far as Shanghai. This operation led the United States to form a defense agreement with Taiwan, effectively preventing the communists from completely defeating the Kuomintang. Peng participated in a number of foreign trips throughout the communist world after becoming Defense Minister, the first time that he had traveled outside of China and North Korea. In May 1955 Peng visited East Germany, Poland, and the Soviet Union, meeting with Wilhelm Pieck, Józef Cyrankiewicz, Nikita Khrushchev, and the Soviet marshals Konstantin Rokossovsky and Georgy Zhukov. In September 1955 Peng traveled to Poland and the Soviet Union to attend the signing of the Warsaw Pact as an observer. 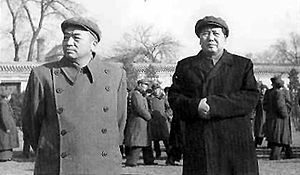 In November 2 – December 3, 1957 Peng accompanied Mao on his second visit to the Soviet Union. From April 24 – June 13, 1959 Peng went on a "military goodwill tour" across the communist world, visiting Poland, East Germany, Czechoslovakia, Hungary, Romania, Bulgaria, Albania, the Soviet Union, and Mongolia. After Peng returned from his first tour abroad, in September 1955, he began to seriously implement his "Four Great Systems": the implementation of standardized military ranks, salaries, awards, and rules of conscription. On September 23, 1955 the State Council named Peng one of the ten marshals of the PLA, China's highest military rank. (Before 1955, Chinese soldiers were assigned "functions" instead of ranks, such as "company commander", or "division commander"). PLA leaders were promoted into Peng's newly founded system of military ranks, and were awarded newly created orders of merit. Peng himself was awarded the First Class Medal of the Order of August 1 (for his achievements in the Chinese Civil war from 1927–1937), the First Class Medal of the Order of Independence and Freedom (for his achievements in the Sino-Japanese War), and the First Class Medal of the Order of Liberation (for his achievements in the Chinese Civil war from 1945–1949). Peng introduced military insignia for the first time, and issued military uniforms modeled on those worn by Soviet soldiers. From January 1, 1956 Peng replaced conscription with voluntary service, and standardized career soldiers' salaries on eighteen grades, from private second class to marshal. In May 1956 Peng introduced a clear prioritization of rank favoring commanders over political commissars. By September 1956 Peng's doctrines of professionalism, strict training, discipline, and the mastery of modern equipment were entrenched within the structure of the PLA. Mao Zedong opposed all of these initiatives, but first focused his dissatisfaction on other marshals, Liu Bocheng and Luo Ronghuan, who Mao accused of "dogmatism" (uncritically assimilating methods borrowed from the Soviet Union). In 1958 Mao convinced Peng of the need to maintain a balance between military professionalism and political indoctrination, and Peng cooperated in removing Liu and Luo from high positions. Peng's removal of Liu especially cost Peng the support of many other military leaders, and Mao used Liu's resulting criticism of Peng to criticize Peng before other senior Chinese leaders the next year, when Mao then sought to remove Peng. Peng was still in command of China's armed forces when Mao ordered the shelling of Jinmen (Quemoy) and Matsu, islands off the coast of Fujian that were still held by the Kuomintang, in the late summer and autumn of 1958. Peng developed a strategy with his Chief of Staff, Su Yu, to bombard the islands so intensely that the morale of their defenders would collapse, eventually leading to the islands' surrender. After the islands' surrender, the PLA would then use the islands to launch attacks against Taiwan. The saturated shelling of the islands included over half the artillery in China, and began on August 28. The attack included a coordinated effort to cut off the islands' air and sea supply lines. The campaign ran into unexpected difficulties, and did not achieve its objectives. The Soviet Union did not give explicit support to the operation, and the United States provided air and sea cover to Kuomintang supply ships up to within three miles of the Chinese coast. Kuomintang fighter jets shot down thirty-seven PRC fighters (while only losing three themselves), and Nationalist artillery and naval bombardments destroyed fourteen PRC ships. Peng had quietly opposed the operation since its beginning, and began to gradually end hostilities after the PLA encountered serious difficulties, announcing a series of intermittent ceasefires before eventually halting the campaign in late October. Su Yu was blamed for the disaster and replaced with another ally of Peng's, General Huang Kecheng. Peng's position was not directly affected, but his personal prestige suffered, and the practical effects of his efforts to modernize China's armed forces were called into question within the PLA. Su was accused of directing the aborted attack on Matzu and withdrawing troops from North Korea without authorization, and of secretly taking orders from the USSR. The conflict between Su and Peng lingered throughout Peng's life, and Su was not rehabilitated until after his death. 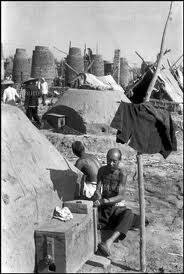 During the Great Leap Forward, many farmers were forced to work in primitive backyard furnaces in order to produce poor-quality steel. In the autumn of 1957 Mao suggested a nationwide programme of mass collectivization, in which China's farmers would be forcibly relocated to large agricultural communes and all private property would be eliminated. Mao's theories on mass collectivization became the basis of the Great Leap Forward, a national economic plan that began in 1958 which caused a man-made famine across the country that lasted for several years. By 1959, tens of millions of people had starved to death. From October–December 1958, the economic system in the countryside broke down as farmers refused to go to work in the fields, raided government granaries for food, and in Guangdong, Hubei, Hunan, Jiangxi, Sichuan, and Qinghai, rebelled. In December 1958 China's leaders quietly decided to reverse the policies of the Great Leap. Peng did not oppose Mao's collectivizations in the first phase of the Great Leap, from late 1957– early 1958, but he increasingly opposed it from spring-winter 1958, as the problems which Mao's policies had caused became more evident. In February 1958 Peng gave a speech for the fortieth anniversary of the Soviet Red Army, in which he suggested increased military cooperation between China and the Soviet Union. Mao opposed this suggestion, and began grooming Lin Biao as a viable successor to Peng for the position of Defense Minister. As part of the Great Leap Forward, Mao ordered the formation of a national militia that was controlled by Party members and independent of the PLA, eventually training and arming tens of millions of civilians. How can they pass the coming year? Allow me to raise my voice for the people! At an enlarged Politburo meeting in Shanghai, held from March 25 – April 1, Peng openly criticized Mao in the Chairman's presence for the first time, accusing him of "taking personal command" of national politics and disregarding the collective leadership of the Chinese government and the Party. Mao responded with vague criticisms of Peng, which Peng said was "provocative". From April 24 – June 15 Peng left on a goodwill military tour through Eastern Europe. Peng met with Khrushchev on May 24, and was criticized during the Cultural Revolution for having criticized Mao's leadership to the Soviet leader, but the evidence that Peng criticized Mao to Khrushchev is very circumstantial, and Mao did not mention this during his efforts to have Peng purged. Peng's absence from China during the seven weeks that he was abroad allowed Mao to freely spread negative rumors discrediting Peng within the Party, and to develop consensus among other senior Party leaders to oppose Peng when he returned. The Eighth Plenum of the Eighth CCP Central Committee was held in the scenic resort town of Lushan, Jiangxi, on July 2, 1959, to discuss Party members' positions on the Great Leap Forward. Mao opened the conference by encouraging Party members to "criticize and offer opinions" on the government's "mistakes and shortcomings", and he promised that he would not attack any member personally as a "rightist" or "counter-revolutionary" for any opinions expressed at the conference. Peng had returned to China just previous to the conference after spending seven weeks abroad and was not planning on attending the conference, but Mao personally phoned Peng and invited him to attend. Peng obeyed Mao and travelled to Lushan to participate in the conference. Peng participated in group meetings in the early portion of the conference, gaining consensus among his peers for criticizing the widespread practice of inaccurately reporting agricultural statistics, and emphasizing that "everybody had a share of responsibility, including Comrade Mao Zedong". Peng bluntly criticized the hesitation of senior Party members to disagree with the Party leadership, implying that many Party leaders were cowardly for following orders that they knew were not in the best interests of the Chinese people. After gaining the consensus of several of his peers, Peng developed his opinions more systematically, but was hesitant to bring up the full range of his criticisms in public. Peng discussed his thoughts with several other senior Party leaders (notably the CCP Secretary of Hunan, Zhou Xiaozhou(周小舟)), and Peng's colleagues encouraged Peng to visit Mao privately in order to win Mao's support for a reversal of the policies of the Great Leap Forward. Peng visited Mao's quarters on the night of July 13, but found Mao asleep, and wrote Mao a "letter of opinion" articulating Peng's ideas instead. Peng delivered the letter to Mao on the morning of July 14, but Mao did not read the letter until July 17. Later on July 17 Mao had Peng's letter widely circulated among the other delegates at the conference. Peng did not intend his letter to be widely read and attempted to prevent its circulation, but was not successful. Most other senior leaders, including Liu Shaoqi, Zhou Enlai, and Deng Xiaoping, supported Peng's position before Mao began to attack it, indicating that they shared Peng's views and that they did not see Peng's letter as an attack on the Chairman. In Peng's letter, Peng compared himself to the courageous but tactless Han dynasty general Zhang Fei. Because of Mao's appreciation of Zhang's enemy, Cao Cao, Mao interpreted this as implying a confrontational relationship. Peng criticized the poor allocation of labour across China, especially the inefficient, country-wide practice of forcing farmers to work in backyard furnaces. He criticized the nationwide famine and severe shortage of cotton, and stated that the Chinese people were justified in demanding change from the present conditions. Peng blamed the problems of the Great Leap on what he called "problems in our way of thinking and style of work", especially the tendency for Party administrators to submit exaggerated production reports, and for Party bureaucrats to accept these figures uncritically. Peng blamed the mistakes of the Party on a culture of "petty bourgeois fanaticism", a tendency to believe in achieving change through blindly encouraging mass movements, and claimed that the acceptance of this culture had led to the Party leadership forgetting "the mass-line and the style of seeking truth from facts", which Peng believed had led to the Communist victories over the Japanese and Kuomintang. Peng criticized Mao's policy of "putting politics in command", substituting economic principles and productive work for political objectives. Mao's decision to have Peng's letter widely circulated completely changed the direction of the conference. On July 21, Zhang Wentian gave an independent, supplementary speech attacking Mao's policies, and the same day a majority of delegates expressed their approval of Peng's letter, making it an official conference document. Mao interpreted the letter as a personal attack, and began to defend himself on July 23, attacking Peng and those who disagreed with his policies. Mao defended his commune system by claiming that "until now, not a single commune has collapsed". He attacked Peng and those who shared his political opinions as "imperialists" "bourgeoisie", and "rightists", and associated their positions with other Communist leaders who had led failed oppositions to Mao's leadership, including Li Lisan, Wang Ming, Gao Gang, and Rao Shushi. Mao brought up an ultimatum, stating that, if the delegates of the conference sided with Peng, Mao would split the Communist Party, retreating into the countryside and leading the peasants to "overthrow the government". The other senior leaders of the Communist Party, including Zhou Enlai and Liu Shaoqi, were unwilling to risk splitting the Party, and sided with Mao in opposing Peng's position. From August 2, the conference debated whether Peng should be disciplined, what punishment Peng should receive, and for what reasons. On August 16 the conference passed two resolutions. The first resolution condemned Peng as the leader of an "anti-Party clique", and called for Peng's removal from the positions of Defense Minister and Vice-Chairman of the Military Commission. The resolution did not eject Peng from the Communist Party, and it allowed Peng to retain his position in the Politburo, but he was excluded from Politburo meetings for years. The second resolution recognized Mao's dominance within the Party and subtly called for an end to the policies of the Great Leap Forward. After Mao had rallied the rest of the Party against him, Peng's options were limited to stubbornly standing his ground, engaging in a humiliating self-criticism, or suicide. After private discussion with other senior leaders, Peng considered the prestige of Mao and the unity of the Party and agreed to make a self-criticism, which was publicly reviewed at the conference, in which he admitted that he had made "severe mistakes" associated with his "rightist viewpoint", that he had been a follower of Li Lisan and Wang Ming, and in which he openly implicated his supporters in his "mistakes". After the conference, Peng said privately to Zhou Enlai regarding his self-criticism: "For the first time in my life, I have spoken out against my very heart!" Mao purged most of Peng's supporters from important offices following the conference, almost completely isolating Peng politically for the rest of his life. Peng later reflected that he was confused that Mao could have interpreted his private letter as a political attack, and wondered why, after thirty years of working together, Mao could not have discussed the matter privately with him, if Peng had indeed made the mistakes Mao claimed he did. In September 1959 Mao replaced Peng as Defense Minister with Lin Biao, effectively ending Peng's military career. Peng was relocated to a suburb of Beijing, forfeiting his Marshal's uniform and military decorations. Lin reversed Peng's reforms, abolishing all signs and privileges of rank, purging officers considered sympathetic to the USSR, directing soldiers to work part-time as industrial and agricultural labourers, and indoctrinating the armed forces in Mao Zedong Thought. Lin's system of indoctrination made it clear that the Party was clearly in command of China's armed forces, and Lin ensured that the army's political commissars enjoyed great power and status in order to see that his directives were followed. Lin implemented these reforms in order to please Mao, but privately was concerned that they would weaken the PLA. Lin used his position as Minister of Defense to flatter Mao by using the army to promote Mao's personality cult throughout China, devising and running a number of national Maoist propaganda campaigns based on the PLA. The most successful of Lin's efforts to promote Mao's personality cult was the "learn from Lei Feng" campaign, which Lin began in 1963. After his forced retirement, Peng lived alone, under constant surveillance from the Central Guard Unit of the PLA, accompanied by a secretary and a bodyguard. His wife remained in Beijing; and, due to her work as the Party secretary of Beijing Normal University, was only able to visit infrequently. Peng's guards prevented curious local farmers from visiting Peng, until Peng threatened to complain to Mao. Peng's niece, Peng Meikui, visited frequently, and the two became close. Peng spent most of his free time renovating his home, gardening, and studying Marxist theory, agriculture, and economics. Peng was not completely purged: even though he could not participate in government meetings or decision-making bodies, he still received and read all documents distributed to the members of the Politburo and State Council, which he was technically still a member of. In 1960 Peng attended the funeral of Lin Boqu. In 1960–1961, the effects of Mao's economic policies continued to produce widespread economic collapse, improving Peng's reputation among Party leaders who secretly believed that Mao's policies were a mistake, and who desired to reverse them. Deng Xiaoping and Liu Shaoqi led Party efforts to revive the Chinese economy, and cultivated Peng's friendship as part of a wider effort to gain widespread support for their activities. In November–December 1961 Peng received permission to leave his residence for the first time since 1959 in order to conduct an inspection tour of Hunan. Peng found the conditions there even worse than in 1959; and, in a January 1962 conference of 7,000 Party leaders to determine Party economic policies, repeated most of the criticisms that he had made at Lushan. On June 16, 1962, Peng submitted a document, his "Letter of 80,000 Words", to Mao and the Politburo, in which he gave a full account of his life, admitted to several "mistakes", defended himself against most of the accusations made against him at the Lushan Conference, requested to be readmitted to decision-making government bodies, and sharply criticized the economic policies of the Great Leap Forward. In his letter Peng first wrote one of his most widely quoted sayings: "I want to be a Hai Rui!" The efforts of Liu and Deng to rehabilitate Peng further were not initially successful. Peng was not allowed to attend the Tenth Plenum of the Eighth CCP Central Committee, held in September 1962, and the efforts to reverse the verdict on Peng made at the Lushan Conference failed. From 1962–1965, Peng continued to live in relative obscurity, though he was no longer under house arrest. After Mao Zedong purged Peng in 1959, Mao appointed Marshal He Long to the head of an office to investigate Peng's past in order to find additional reasons to criticize Peng. He accepted the position but was sympathetic to Peng, and stalled for over a year before submitting his report. Mao's prestige weakened when it became widely known that Mao's Great Leap Forward had been a disaster, and He eventually presented a report that was positive, and which attempted to vindicate Peng. In September 1965 Mao agreed to rehabilitate Peng by promoting him to a position managing the industrial development of Southwest China, a project known as the Third Front. Peng initially refused this position, so Mao called him personally, and convinced Peng to accept it by suggesting that the condemnation of Peng at the Lushan Conference may have been a mistake. Peng was then appointed "Deputy Commander of the Great Third Line of Construction in Southwest China" and "Third Secretary of the Control Commission of the CCP's Southwest Bureau". In practice, Peng's responsibilities were to oversee the industrial development of Sichuan, Guizhou, Yunnan, and Tibet, with a focus on developing military industries and logistical networks. These positions were far below what Peng's position had been before 1959, but signaled his return to national politics. Peng worked energetically until August 1966, when the beginning of the Cultural Revolution had him recalled to Chengdu and the first Red Guards began patrolling the streets, violently attacking their perceived enemies. Peng's bodyguards warned him to avoid contact with the Red Guards, but Peng disregarded their advice, saying: "a CCP member does not have to be afraid of the masses." Peng's disregard for personal danger and his confidence in the Chinese Communist Party made him one of the Cultural Revolution's first victims. Peng Dehuai (1966) was brought to Beijing in chains by Red Guards, where he would be tortured and publicly humiliated for years. Peng was one of the first public figures singled out for persecution in 1966 by the Cultural Revolution Group. The Party Secretariat attempted to shield Peng, but Mao's wife, Jiang Qing, took a personal interest in Peng's persecution and directed Red Guards in Sichuan to find Peng in Chengdu, arrest him, and deliver him to Beijing to be persecuted. Local Red Guards in Chengdu were not enthusiastic to follow these orders: they visited Peng's house on December 22, 1966 and attempted to intimidate Peng by informing him of the recent arrests of some of his friends and comrades, and of the imminent arrests of Liu Shaoqi and Deng Xiaoping. Because of local Red Guards' lack of enthusiasm to carry out Jiang Qing's orders, a more radical Red Guard leader, Wang Dabin, arrived in Chengdu on December 24, and denounced his local comrades as "rightists" and "traitors" for delaying Peng's arrest. The Red Guards then abducted Peng in the early morning of December 25, put him in chains, and ransacked his house. Peng's bodyguards arrived to save Peng at around 4:00 AM, but were already too late. Prime Minister Zhou Enlai made an effort to save Peng by placing him under PLA surveillance. On December 25, Zhou's office ordered the Red Guards who had abducted Peng to accompany members of the PLA from Chengdu, to deliver Peng to Beijing by train (instead of by plane, because the airports in Sichuan had been taken over by Red Guards), and then to deliver Peng to the Beijing PLA garrison. After the party arrived in Beijing, Wang Dabin successfully directed Red Guards under his command to delay the PLA unit scheduled to take possession of Peng, and succeeded in keeping Peng from being saved. In January 1967 Peng was taken to his first "struggle session", in which he was paraded in chains before several thousand jeering Red Guards, wearing a large paper dunce cap and with a wooden board hung from his neck, on which his "crimes" were written. In the fall Peng was held at a PLA military prison outside of Beijing, and was allowed to receive extra clothing. In July Mao and Lin Biao, cooperating with Jiang Qing's faction, ordered the PLA to form an "investigation group" to determine Peng's "crimes", so that Peng could be more thoroughly humiliated in future struggle sessions. Peng's jailers attempted to force Peng to confess that he was a "great warlord", a "great ambitionist", and a "great conspirator" who had "crept into the Party and the Army". Peng refused to confess to these accusations or to "surrender to the masses", so his jailers strapped Peng to the floor of an unlit cell, and did not allow him to stand or sit up, drink water, rise to go to the toilet, or move in his sleep for several days. After Peng still refused to "confess", his jailers began routinely beating him, breaking several ribs, injuring his back, and damaging his internal organs, especially his lungs. Peng's violent "interrogations" lasted over ten hours a day, but his interrogators were replaced every two hours in order to keep them from developing any sympathy for Peng (a practice pioneered by Stalinist secret police in the 1930s). Peng was "interrogated" in this way over 130 times. During interrogations he shouted denials to the Red Guards who beat him, and it is reputed that he pounded the table so hard that the cell walls shook. In late July 1967, following the failed Wuhan Uprising, Party leaders decided that Peng should be used as an example by publicly humiliating him by name at a national level. On July 31, an article appeared that was distributed nationally, and which directed the nation to take part in vilifying him. In this article, Peng was called a "capitalist", a "great ambitionist and great conspirator" who had "always opposed Chairman Mao", and who was "the representative of the greatest capitalist-roader [Liu Shaoqi] in the army". The article accused Peng of conspiring with foreign countries, allying with "imperialists, revisionists, and counter-revolutionaries", and waging "a wild attack against the Party". The campaign of national vilification against Peng lasted several months, until late 1967. On August 16 another article stated that Peng "was never a Marxist", but that he had instead been a "capitalist great warlord" who had "crept into the Party and into the army... we have to struggle against him until he falls, until he breaks down, until he stinks." CCP propagandists made an effort to discredit Peng's military career by portraying it as a long string of failures, except for those battles that were supposedly directed closely by Mao Zedong, and to convince the Chinese people that Peng was a subhuman villain who should be destroyed without compassion or mercy. In August 1967, Peng was taken to a "struggle meeting", which was held in a stadium attended by 40,000 PLA soldiers. At this meeting, Peng was led in chains to a stage, where he was forced to kneel for several hours while he listened to soldiers repeatedly denouncing him for his "crimes". At the end of the meeting, Lin Biao personally appeared to the soldiers, where he addressed the assembled soldiers and Peng, who was still kneeling. Lin gave a speech in which he denounced Peng as a villainous element who must be purged, and that it was "in the interest of the whole Party, the whole army, and the whole people of the whole country" to persecute Peng so severely. Lin then addressed Peng directly, stating: "If you reform yourself, all right, if not, it is all right too. But of course we hope you reform yourself." It is not known whether Peng eventually broke down and "confessed" at the rally. Peng was imprisoned for the rest of his life. In 1969 the Party formed a "special investigation group" to reach a verdict in his case. Peng's jailers then forced Peng to write a full biography of his life many times, but they did not believe that he ever fully confessed his "crimes". Peng was then subjected to constant violent "interrogations" throughout most of 1970, until a special military tribune sentenced Peng to life imprisonment. The sentence was immediately approved by Lin Biao's General Chief of Staff, Huang Yongsheng. After the 1971 Lin Biao incident, the military attempted to improve Peng's living conditions, but the years of deprivation and torture from 1967–1970 had seriously weakened his physical health, and from late 1972 until his death Peng was seriously ill, probably with tuberculosis, thrombosis, or both. Peng was briefly hospitalized in 1973 before being returned to prison, the first time that he had been outside of prison since 1967. Peng's niece, Peng Meikui, visited Peng in the hospital and convinced his jailers to allow an operation, but the nature and results of this operation are unknown. Peng's medical condition deteriorated further in 1974; but, because of direct orders from Mao not to treat him, he received no substantial medical aid. Peng died at 3:35 PM on November 29, 1974. His last wish was to see the sun and trees outside the windows of his hospital room (the windows were covered with newspaper), but this request was denied. Peng Meikui was allowed to view Peng's body for twenty minutes, but was then removed. Peng's body was quickly cremated, and his ashes were sent to Chengdu, identified only by a note that read: "No. 327 – Wang Chuan, from Chengdu." The leadership of the CCP successfully concealed Peng's death for several years, and successfully convinced the only civilian witness, Peng Meikui, not to tell anyone of Peng's death. Peng former bodyguards did not learn of his death until 1976. Peng's wife, Pu Anxiu, had also been arrested by Red Guards and "sentenced" to a "labour reform camp", where she remained until 1975, when she was released to settle as a farmer in North China. She did not find out about Peng's death until she was allowed to return to Beijing, in 1978, when the news was first publicly disclosed. He was courageous in battle, open and straightforward, incorruptible and impeccable, and strict towards himself. He cared about the masses, and was never concerned about his own advantage. He was never afraid of difficulties, neither of carrying heavy loads. In his revolutionary work, he was dilligent, honest, and he had an utmost sense of responsibility. Deng's speech also stated that Mao's decision in 1959, which vilified Peng as the leader of an "anti-Party clique", had been "entirely wrong", and that it had "undermined intra-Party democracy". From January 1979, the Party encouraged historians and those who had known Peng to produce many memoirs, historical stories, and articles praising and remembering Peng. In 1980 the Intermediate Court of Justice in Wuhan sentenced Wang Dabin, the Red Guard who had directed Peng's arrest in 1966, to nine years in prison for "the persecution and torture of Comrade Peng Dehuai". In 1986, an "autobiography", Memoirs of a Chinese Marshal, was compiled from various documents that Peng had written about his life. Much of the material for Memoirs was drawn from the "confessions" that Peng had written during the Cultural Revolution, and the book focused on Peng's early life, before the Second Sino-Japanese War. In 1988, China released a set of stamps to commemorate the ninetieth anniversary of Peng's birth. In modern China, Peng is considered one of the greatest military leaders of the twentieth century. ^ 十大元帅中谁被斯大林称为天才军事家？. Ifeng News. Retrieved 2011-12-21. Peng, Dehuai (1981). 《彭德怀自述》 (in Chinese). 人民出版社. OCLC 13633223. 《彭德怀传》编写组 (2006). 《彭德怀传》 (in Chinese). 当代中国出版社. ISBN 978-7-80092-103-2. Appleman, Roy. Disaster in Korea: The Chinese Confront MacArthur, College Station, TX: Texas A and M University Military History Series. 1989. ISBN 978-1-60344-128-5. Casella, Alexander. "China's Military Comes to Terms with Its Past". Asia Times Online. September 12, 2009. Retrieved February 10, 2012. "J155 90th Anniv. of Birth of Comrade Peng Dehuai". China Stamps Here. October 26, 2012. Retrieved February 10, 2012. Chung, Jang. Wild Swans: Three Daughters of China. Touchstone: New York, NY. 2003. ISBN 0-7432-4698-5. Domes, Jurgen. Peng Te-huai: The Man and the Image, London: C. Hurst & Company. 1985. ISBN 0-905838-99-8. Ebrey, Patricia Buckley. (Ed.) Chinese Civilization: A Sourcebook. Second Ed. United States of America: The Free Press. 1993. ISBN 0-02-908752-X. Retrieved November 17, 2011. Garver, John W. Chinese-Soviet Relations, 1937-1945. Oxford: Oxford University Press. 1999. ISBN 0195054326. Lee, Khoon Choy. Pioneers of Modern China: Understanding the Inscrutable Chinese. Singapore: World Scientific Publishing. 2005. ISBN 981-256-464-0. Retrieved November 19, 2011. Lew, Christopher R. The Third Chinese Revolutionary War, 1945-1949: An Analysis of Communist Strategy and Leadership. The USA and Canada: Routelage. 2009. ISBN 0-415-77730-5. Li Xiaobing. A History of the Modern Chinese Army. Lexington, KY: University Press of Kentucky. 2007. ISBN 978-0-8131-2438-4. Memoirs of a Chinese Marshal: The Autobiographical Notes of Peng Dehuai. University Press of the Pacific. 2005. ISBN 978-1-4102-2137-7. Millett, Allan R. The War for Korea, 1950-1951: They Came From the North. Lawrence, KS: University Press of Kansas. 2010. ISBN 978-0-7006-1709-8. "Peng Dehuai". People's Daily Online. Retrieved May 5, 2012. "'Peng Dehuai's Complete Biography': Recalling Su Yu's Three Great Mistakes" Phoenix Online Comprehensive History. December 15, 2009. Retrieved June 30, 2014. [Chinese]. Qiu Jin. The Culture of Power: The Lin Biao Incident in the Cultural Revolution. Stanford, California: Stanford University Press. 1999. Retrieved November 12, 2011. Rice, Edward E. Mao's Way. Berkely: University of California Press. 1974. ISBN 0-520-02623-3. Roe, Patrick C. The Dragon Strikes. Novato, CA: Presidio. 2000. ISBN 0-89141-703-6. Salisbury, Harrison E. The Long March: The Untold Story. New York: Harper & Row. 1985. Snow, Edgar. Red Star Over China. Penguin. 1972. ISBN 0-14-021433-X. Tanner, Harold Miles. China: A History. Indianapolis, Indiana: Hackett Publishing Company. 2009. ISBN 978-0-87220-915-2. Retrieved November 17, 2011. Yang Lijie. "'Six Poems to Comrade Peng Dehuai' (October 1935)". Xinhuanet. 2011. Retrieved May 4, 2012. Yang Jisheng. "The Fatal Politics of the PRC's Great Leap Famine: the preface to Tombstone". Journal of Contemporary China. Vol.19, Issue 66. pp. 755–776. July 26, 2010. Retrieved December 7, 2011. Zhang Shu Guang. Mao's Military Romanticism: China and the Korean War, 1950–1953. Lawrence, KS: University Press of Kansas. 1995. ISBN 0-7006-0723-4. Video of Peng Dehuai, Peng Zhen, Wu Han, Zhang Wentian, and others being paraded in public during the early Cultural Revolution on YouTube. This page was last edited on 10 March 2019, at 20:48 (UTC).